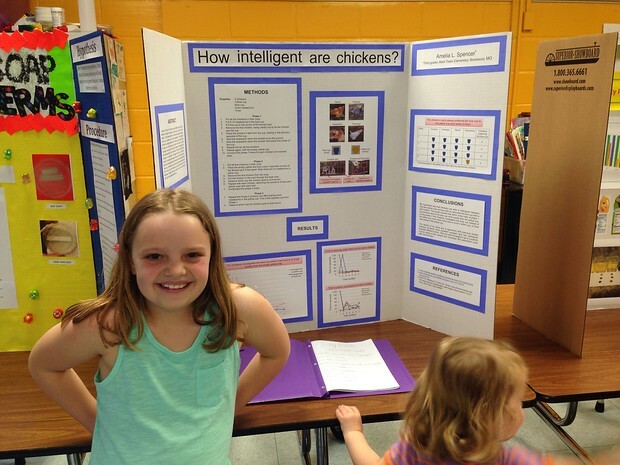 2015 marks the first year of science fair project opportunities for the Spencer family, and I mean family! Amelia was enthusiastic when we came up with a project using our much loved hens. We decided to see if we could train the chickens to choose a blue cup over a yellow cup using meal worms as a reward. Amelia enjoyed the experiment phase which included lots of time moving and timing the chickens. The enthusiasm started to disappear when it came to completing her log book and poster. There were a couple late nights for all of us. At one point Dave showed Amelia one of his posters. She was very impressed saying “that looks like it’s from the internet. Wait, where are your references? How do I know you didn’t just copy that from the internet? !” Ah, she’s a smart one, and as one of Dave’s colleagues said, there were science teachers everywhere smiling when she said that. Here is the final product. Amelia went to bed as I was gluing the final pieces so when she saw it the next morning she said, “Wow! That looks great, like a couple sixth graders did it.” We are taking that as a compliment. i too am smiling at Amelia’s desire for references-more than many high schoolers I teach! I love that that was her reaction to Dave’s poster-can’t wait for Hux’s first big project (or maybe I can as I don’t want to have to glue like a sixth grader all night long)!